As custom-made prosthetics can now be easily created with 3D printing, bioengineers are exploring other methods to manufacture real cellular materials. This technology could form the origin for tissue-engineered skin, personalized biomedical devices, bone, cartilage, and even working bladders. The latest study will be published in a Trends in Biotechnology special issue on biofabrication on August 17, in which the researchers have assessed and accounted for the developments made in 3D bioprinting and what could be achieved in the coming years. The team has proposed five ways to use 3-D printing. 'Organs-on-a-chip' is a 3D microengineered system that mimics the function and structure of human tissue. The system is a strong candidate in the race to bring efficient and low-cost personalized medicine to the market. As of now, pancreatic tissue, gut, and lung have already been made from human stem cells on the chips, enabling scientists to examine the physiological variations in these cells between patients, in addition to drug screening. While the widespread adoption of this technology are limited by manufacturing challenges, 3D printing could reduce the costs and labor required to construct, seed, and fulfill the requirement for such chips. The intersection of 3D printing for microfluidic fabrication and bioprinting 3D tissues shows great promise in the direction of single-step organ-on-a-chip engineering and can allow greater flexibility and throughput in the research process. In future studies, more advanced 3D bioprinters that can print a range of viscous materials may be utilized to print and fabricate both the microfluidic platform and patterned complex tissues inside the device simultaneously. Such closed integrated systems will greatly simplify the fabrication of organ-on-a-chip models and enable faster iterations of organ-on-a-chip designs. Printed skin, created from cells arranged on a collagen gel, revealed the presence of biologically normal cell markers and intercellular connections 10 days following cultivation. In another study, scientists have successfully grown blood vessels in this cell sheet. It is now a reality to utilize sophisticated machine control to create tissue-engineered constructs. Although the ultimate goal of bioprinting a skin equivalent with complete functional performance has yet to be achieved, bioprinting shows promises in several critical aspects of skin tissue engineering, including creating pigmented and/or aging skin models, vasculature networks, and hair follicles. Skin, cartilage, bone, muscle, nerves, and blood vessels have already been printed in a laboratory, but the construction of more complicated designs which can be used on patients is still being developed. For instance, cancer patients or those who have suffered facial injuries can benefit from craniofascial reconstruction, which appears to be a strong contender for further studies, due to the extent of research that has already been done on these types of cells. Meanwhile, 3D printed scaffolds could be applied to enhance the spot defects in the jaw or other parts of the face. With the need for long-term (pre)clinical studies, intelligent polymers, and ultimately good manufacturing production of bioprinted constructs, there is still a long road ahead. 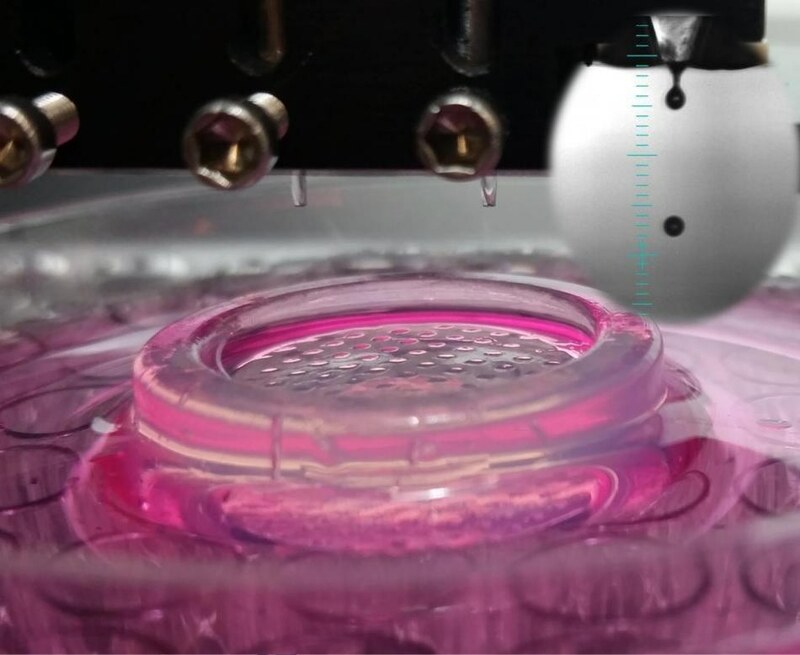 A promising future approach for the treatment of external craniofacial tissues could be a handheld bioprinting device that will enable the delivery of cells into tissues such as skin or cartilage. For now, focusing on the optimization of bioprinting technologies to enhance the self-repair capabilities of tissues in the craniofacial area seems a logical first step in clinical bioprinting. Through 3D bioprinting, it has been observed that precise models can help to enhance the way new drugs are evaluated, e.g. by producing "organoids" containing different types of cells, in addition to a tumor model with fabricated blood vessel networks. Though such methods could enable fast, real time monitoring of drug interactions in various organs, more iteration in the form of joining organ models, adding blood vessels, etc. will be required to achieve this objective. Along with the development of novel advanced bioprinting techniques, fabrication of physiologically relevant tissue models will become a vital tool in pharmaceutical development in the next decade. Integrating with other 3D biofabrication and supporting techniques, bioprinted organ/human-on-a-chip models and microarrays will significantly decrease the attrition rate of new therapeutics in preclinical trials and significantly shorten the drug development process. Bioengineered tissues would be required to ensure tissue survival following implantation and for an accurate simulation of human anatomy. Several efforts have been made to grow 3D networks of blood vessels inside bioengineered tissues, mainly focusing on arranging bioprinting 3D networks or 2D cell layers, which enable excellent spatial control. However, a major difficulty was to synthesize tissues with engineered blood vessel networks which could be linked directly to a patient's veins or arteries. Vascularization is currently regarded as one of the main hurdles that need to be taken to translate tissue engineering to clinical applications at a large scale. It is clear that approaches that focus on the active patterning of vascular cells within engineered tissues provide the highest level of control over the initial organization of vascular structures.